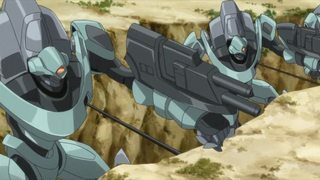 Knightmare Frames are humanoid war machines developed by the Holy Britannian Empire and unveiled during the invasion of Japan. Is there any known scientist behind their creation, like how Nina created FLEIJA? The earliest known developers of knightmare frames were the Ashford Foundation wih their development of the third generation Ganymede and the Io series. However, both of those models were cancelled at the prototype stage because the Ashford Foundation closed down. The cost to develop the nightmares were too high and Milly's grandfather was too much of a fan of old fashioned extravagant parties. After that he used his party connections to move to Area 11 and to become principal of what is now known as the Ashford Academy. They talk about all this in the second picture drama, stage 3.25. Aside from Milly's grandfather the only other known developers are Lloyd, Cecile, and Rakshata.